Designed for Extreme Requirements — The DVI-7340 is a high-performance, cost-effective 4K Optical Extender designed to meet and exceed even the most demanding system requirements. 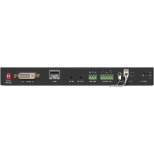 It supports an enormous array of signal types with or without HDCP content protection, provides long-distance extension over a single fiber cable, and supports ultra-high resolutions up to 4K (UHD). Multiple Signals, High Resolutions, One Cable — This extender supports multiple signals such as uncompressed HDMI or DVI, embedded audio, balanced or unbalanced external audio, bidirectional IR, RS‑232 and Ethernet using a single fiber optic cable. It supports HDMI with embedded audio as well as independently routed balanced audio signal extension. It extends HDMI v1.4 (HDCP compliant) signals with flawless image quality at resolutions up to 3840x2160 /30p (4:4:4) and 3840x2160�/60p�(4:2:0). 3x EDID modes are provided: Pass-through, Learn, and Factory Default. The unit supports cable distances of up to 1,000 ft. (300 m) with or without HDCP. In applications where HDCP support is not needed, this extender supports optical links up to 1.2 miles (2 km). 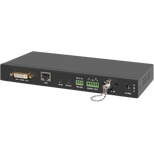 Fiber Optic Technology — The extender set consists of an optical transmitter module that converts the AV signals into light pulses for transmission over a single strand of Multi-Mode or Single-Mode LC-terminated optical fiber cable. An optical receiver module converts the light pulses back to AV signals for the display as well as other downstream devices. By using fiber optic technology, this extender can achieve much greater distances than other extension methods such as copper cables or CAT-X extenders. All these features make the DVI‑7340 the ideal future-proof, cost-effective choice for systems designers and integrators who need to support high resolution HDMI / DVI signals with or without HDCP over extreme distances. Data Rates 1310nm = 10.2 Gbps. Optical Transmitter / Receiver The TX and RX units should be powered by the supplied external power adapters. Note 1: The Transmitter and Receiver Units are sold separately. The accessories shown here are included per unit. This unit can be used to simplify power distribution to various devices within a rack environment. 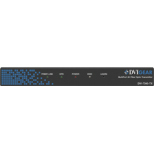 The DVI-7525-PDU provides +5VDC power for up to eight (8) products such as DVIGear's MultiPort 4K Fiber Optic Extenders. 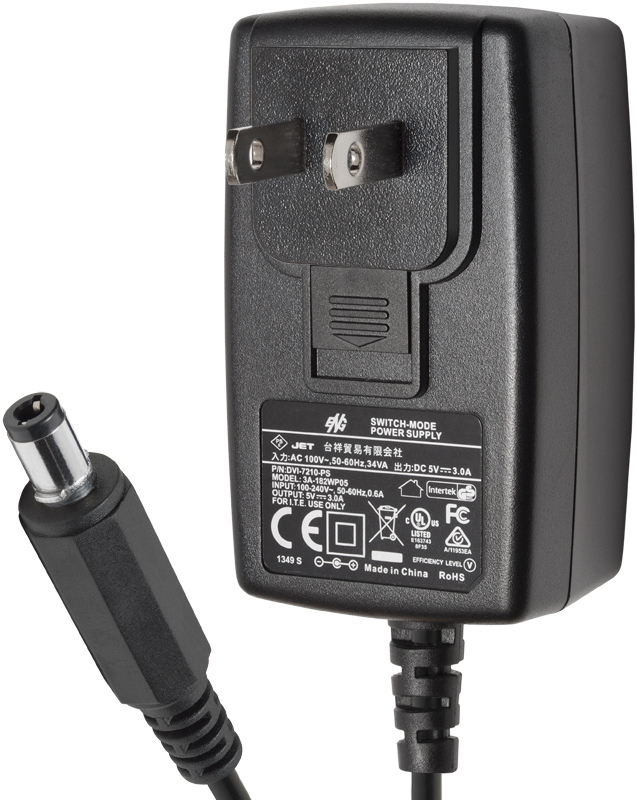 Additional AC Power Adapter with USA, Euro, UK, or Australia Plugs. 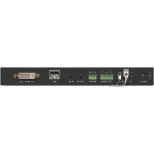 The DN-100-RMK is a full width Rack Mount Kit that allows two (2) DVIGear MultiPort 4K Fiber Optic Extender units to be mounted side-by-side securely within a 19" rack. The DVI-7360-IR-TX Infra-Red Remote Transmitter accepts IR signals from DVIGear products with IR transmitting capabilities and sends them to external IR receiving devices. 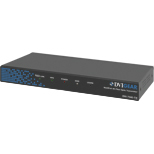 The DVI-7361-IR-RX Infra-Red Remote Receiver accepts IR signals from external IR transmitting devices and sends them to DVIGear products with IR receiving capabilities. The DVI-8511b Adapter Cable allows the connection of a DVI cable to the MultiPort 4K Fiber Optic Extender. 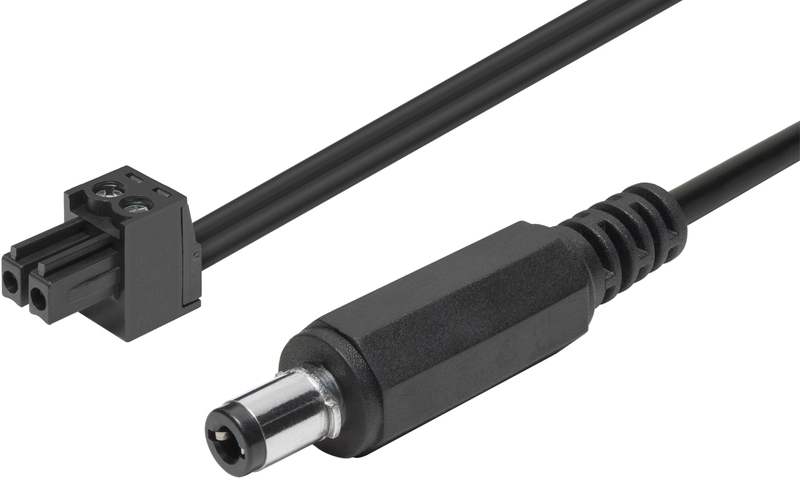 The DVI-8410a Adapter Cable allows the connection of an HDMI cable to the MultiPort 4K Fiber Optic Extender.